With Friday’s 6-0 victory over No. 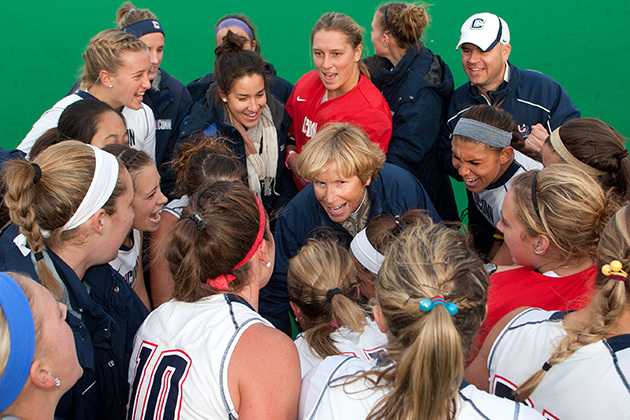 14 Louisville, UConn’s head field hockey coach Nancy Stevens became the all-time winningest coach in NCAA Division I history. Stevens, who entered the 2013 season as the winningest active coach in the NCAA, now sports a career record of 562-172-24 in her 35th year, for a winning percentage of .758. She supplants former Old Dominion coach Beth Anders as the sport’s all-time winner. Anders finished her career with a record of 561-136-7 over 30 seasons. Stevens, who spent seven seasons at Northwestern before coming to UConn in 1990, has led her teams to eight appearances in the NCAA semifinal, and 20 trips to the NCAA quarterfinal. A 2007 National Field Hockey Coaches Association Hall of Fame inductee, she has led the Huskies to 24 Big East Championships and has been honored as the league’s Coach of the Year seven times. A graduate of West Chester University, Stevens was inducted into her alma mater’s hall of fame in 2003, and was inducted into the Connecticut Field Hockey Hall of Fame in 2006.